Former national player, Donnie Robinson, of the Robinsons' "Basketball Family"
Segment E of Basketball in The Family featured the following "Basketball Families": Jennifer Nanton and her daughter; Perry Payne, Ursula Ophar and their son; Reginald Thomas and his son; Charles Walters and his son; and Dunstan Peters and his son. The article continues. 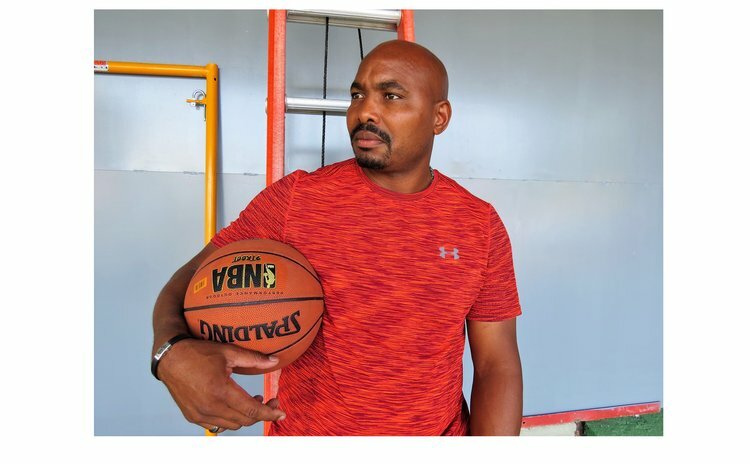 Edgar, popularly known as "Robo", contributed to Dominica's basketball in several areas of the sport over a period spanning almost five decades, and that includes playing with five teams in the National League. Starting with Dominica Grammar School, Robo later played with Electrons upon leaving school. Some years later he was a founding member of Harks, and he subsequently joined Pioneers for a few years before becoming the main architect behind the formation of Blazers Division I (highest level) in the mid-1990s. Apart from playing, Robo also served as a senior referee; he was the President of the Dominica Amateur Basketball Association Executive for three separate terms, and also held other positions on the Executive. Furthermore he served as Head Coach of Harks, Blue Jays, Blazers and the Dominica National Team; he also managed the National Team. Robo was featured in a report on "Selected Statistics and General Information From the Dominica Amateur Basketball Association 2015 Basketball Season", prepared by this author on behalf of the DABA. Gregory, Robo's first son, first played basketball in the Intermediate Division (Div. II) of the National League with Dominica Grammar School in the 1980s. Thereafter, he played with Sharpers in that same Division for about five years. He recalls averaging in the 20s, and played in the position of Forward. Gregory also "bounced 'ball" in the Netherlands when he played in the Division II League in Breda, Holland. He played on the Breda Sports Club team in 1992. Hassan, aged 27, is Gregory's son and Edgar's grandson. He first played basketball with Pierre Charles Secondary School in the Schools' League, and after graduating from high school he played with Falcons in Division I in 2016, followed by Thundererz of Grand Bay in 2017. Donnie, Robo's second son, began playing competitive basketball in Division II of the National League as a member of the Dominica Grammar School team, in the late 1980s. He then played briefly with Hoyas in the 16 & Under Division in 1988. Donnie's next team was Clifton Dupigny Community College, and he represented Dominica for four years (1988 through1991), in the basketball segment of the Windward Islands Inter-Schools Games. Donnie then moved to the uppermost level of the National League in 1989 and played with Harks initially, until the formation of Blazers - with whom he played for several years. Subsequently, Donnie played with Clouds (Premier Division), and one of his big scores in 1997 was 26 points, vs Hoyas. More recently, Donnie played with No Look, although he is quick to admit that his heart has always been in Blazers' camp. Donnie got selected to the Senior National Team the same year that he began playing in Division I, and represented Dominica from 1989 to 1997, in the Windward Islands and OECS Basketball Tournaments. Donnie also played in the Middle East while working in Qatar, and it is interesting to note that Robo, Gregory and Donnie all played together on the same team in the Fond Colé and Windsor Park Off-Season Leagues. Reginald, Edgar's third son, played competitive basketball with St. Mary's Academy, in the Schools League in the 1990s. Thaj, Robo's fourth son and the Robinsons' newest "kid on the court", currently plays with 7Six7 S.C. Young Ballerz in DABA's Under-17 League, which was inaugurated in 2017 and run concurrently with the National League. Edmund's next team was Falcons - also from Pichelin – and he started with them in the second level Men's Division (called Division I). Falcons won the 2013 Division I Championship, and so were promoted to the Premier Division as of 2014. Subsequently, the Falcons Basketball Club began fielding two teams in the National League: one each in the Premier Division and in Division I.
Daddy Edmund remained with Falcons in the Premier Division until 2016, and then went down to "assist" the youngsters in his Club's Division I team as of 2017. He may return to the Premier Division in the future. Edmund also played with Falcons in the Roseau Valley Basketball League, and in friendlies at Soufriere. Edmund Jr., now only 20 years old, has played with four teams to date: two in the Sports Division "Schools" League and two in the National League. In the Schools League, Edmund first played with Pierre Charles Secondary School. Then while attending college, he was a member of the Dominica State College (DSC) team, where he was a regular high-scorer. While attending the DSC, Edmund Jr. played in the National League simultaneously with two (2) teams, in two different Divisions. First he played with Secondary Schools in Division II (3rd level) in 2013. From the following year, the League was shrunk to two men's Divisions, resulting in the team of secondary school and college players, which was then renamed "Inter-Schools", playing in Division I thereafter. While playing with Secondary Schools and Inter-Schools, Edmund Jr. was – and still is – a member of Falcons in the Premier Division, and played on the same team as his Dad during the same period. Edmund Jr. also represented Dominica in the basketball segment of the annual Windward Islands "Inter-Schools" Games, both here and overseas.